Exporter of a wide range of products which include metal cutting band saw machine, double column metal band saw machine, semi automatic band saw machine, metal band saws machine, semi automatic metal cutting band saw machine and degree cutting machine. 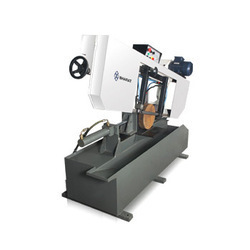 Providing for superior miter cutting capabilities, these Metal Cutting Band Saw Machine options are suitable to be used for light to medium duty applications. The system also features presence of band or circular saw blade that allows easy and more convenient cutting of structural steel and other metals as per the specific process requirements of the customers. Some of its advantages include providing for economical, low cost operations, available with automatic/semi – automatic/manual operating controls, supporting the demands of high repeatability and work accuracy, clamping & de-clamping support and standard accessories support of saw motor, coolant pump, V-Belt, job stopper & roller, hydraulic motor and others. 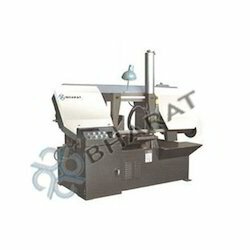 We are on of the leading manufacturing ans supplying unit of Double Column Metal Band Saw Machine. 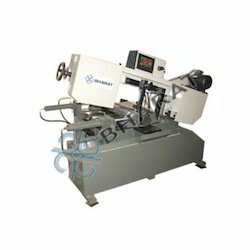 we are the manufacturer, exporter and supplier of b - 210 - sa semi automatic band saw machine. 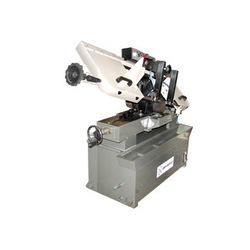 Coming with support of blade tracking and tension windows, these Metal Band Saws Machine provide for easy usage as well as accurate working support. Featuring presence of hinged blade guard, its quick release blade tension is designed for operating horizontally as well as adding to ease of usage. Some of its features include cast iron table with trunnion system, tool holder for easy handling of tools, enclosed cabinet support for storage of extra blades, adjustable blade guide bearings, heavy-duty fence with resaw bar and others. We have gained vast expertise in offering a superior range of Metal Cutting Band Saw Machine which is ideal for heavy load operations. These are well-known for its high performance, low maintenance and durability. They are widely used for varied industrial applications like cutting of metals and other materials. Clients can avail these in different dimensions, sizes and shapes as per their requirement and at affordable prices. These machines are checked on the various quality parameters to deliver defect free range to our customer. 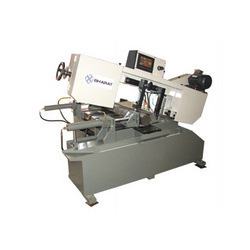 We are the manufacturer, exporter and supplier of B - 210 - SA Semi Automatic Metal Cutting Band Saw Machine. We offer an extensive range of superior quality Channel Cutting Machine, which is engineered under the supervision of our highly experienced professionals, are being offered to all our clients. Furthermore, the professionals of our team follow the certain guidelines of industry and work hard to accompany defined industry norms which ultimately help us to achieve maximum client's contentment. We are offering this product at a reasonable market price and we manufacture the same by using high quality raw material taken from trusted sources. Providing for superior miter cutting capabilities, these Round Bar Cutting Machine options are suitable to be used for light to medium duty applications. The system also features presence of band or circular saw blade that allows easy and more convenient cutting of structural steel and other metals as per the specific process requirements of the customers. Some of its advantages include providing for economical, low cost operations, available with automatic/semi – automatic/manual operating controls, supporting the demands of high repeatability and work accuracy, clamping & de-clamping support and standard accessories support of saw motor, coolant pump, V-Belt, job stopper & roller, hydraulic motor and others. Packaging Details: Wooden Box Packing Charge Will Be Extra As Actual. 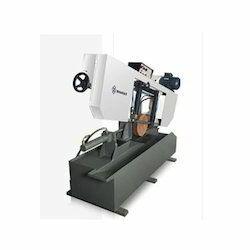 Providing for superior miter cutting capabilities, these Swing Type Metal Cutting Band Saw options are suitable to be used for light to medium duty applications. The system also features presence of band or circular saw blade that allows easy and more convenient cutting of structural steel and other metals as per the specific process requirements of the customers. Some of its advantages include providing for economical, low cost operations, available with automatic/semi – automatic/manual operating controls, supporting the demands of high repeatability and work accuracy, clamping & de-clamping support and standard accessories support of saw motor, coolant pump, V-Belt, job stopper & roller, hydraulic motor and others. Our company has achieved laurels in offering Horizontal Metal Band Saw Machine to the clients. This product is widely used in industrial premises as a major tool for shaping and cutting of metal sheets, wood blocks and other related material. Offered range is manufactured using unmatched quality components under the direction of dexterous professionals. Horizontal Band Saw Machine is widely demanded by customers for cutting various metals like, steel, brass, copper and many others in various shapes and sizes. Offered range is available in various technical specifications in order to cater the need of the clients.